If vegetable stock is not available plain water can also be used. I love this soup. Looks great! Yummy and tasty soup, one of my favourite too. very healthy and yummy soup. The soup looks hearty and wonderful. How did you get a light orange-ish colour? Is it from the carrots? All the sweet corn soups I've seen are usually white in colour. The yellow color is due to the addition of carrots. 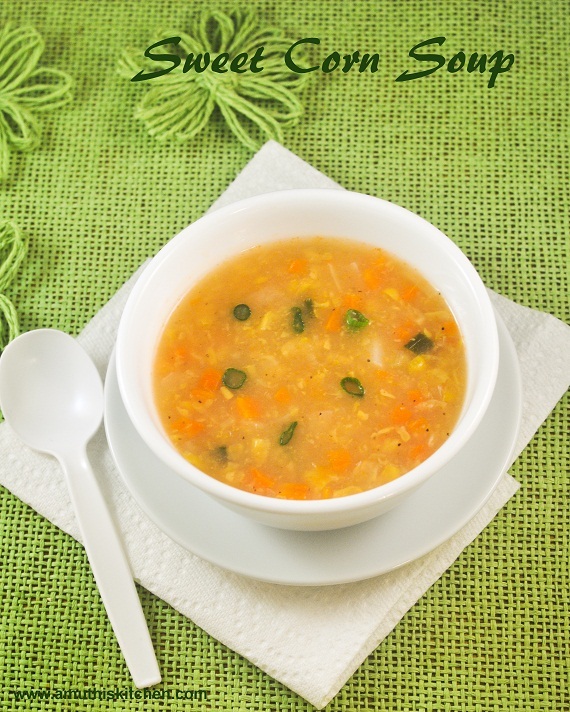 Super filling soup, prefect for dinner, definitely this soup will keeps me comfort. My older one loves this soup! I should make this soup some time soon. The soup surely looks very inviting..with summer coming I can imagine these soups being more often..
wow the color!!! so aromatic and so flavorful too!!! AN all time favorite soup.. Can have it anytime..
Corn soup looks amazing.. So simple and easy to make too.